Matthew helped his readers find their way about his chronicle by means of marginal diagrams. 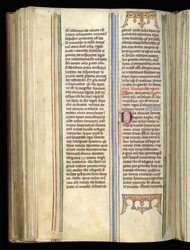 This section of the manuscript is a continuation of Matthew's chronicle, written after his death. On this page the rubric introduces a description of the death of Eleanor of Castile, wife of King Edward I of England, in 1290. In the upper and lower margins are upside-down crowns, copying Matthew's method of indicating a royal death.